NORTH, SOUTH, WEST, EAST, MIDLANDS, Spain Route ideas and places to go. There will be a number of route options but all will include the summit of Slieve Donard, the highest in Ulster. 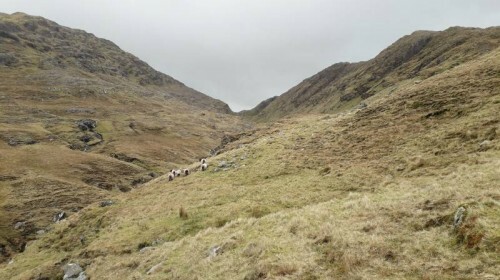 Depending on the weather the walk will continue to Slieve Commedagh and may include part of the Brandy Pad, an old smugglers route from the coast. We will be based in the town of Newcastle in Co. Down where there are a large number of accommodation options from Bed and Breakfast right through to the luxurious Slieve Donard Hotel. A post walk meal will be arranged in a restaurant in Newcastle where you will have an opportunity to relax and enjoy the company. Mon 8th April 2019. Note: date different from previous ad There will be a talk by members Martin Critchley and Sharron Schwartz of "Purple Peak Adventures" at 8pm. 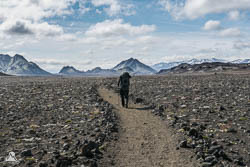 The title will be "Trekking the Realms of Vulcan: Adventures in the volcanic highlands of Iceland and Ethiopia". Join us as we trek two incredible routes through two very different countries, in different continents, with very different cultures, climates and landscapes, yet underpinned by a similar geology. These meetings are being organised by the MountainViews committee. Talks are held in the Lansdowne Hotel, 27 - 29 Pembroke Road, Dublin 4 at 8pm unless otherwise stated. Entry is free unless otherwise stated. There is a voluntary collection. Directions here www.lansdownehotel.ie . The excellent bar facilities allow you to have a drink with other hillwalkers before or after the event. You can get a meal before the meeting also. Should you wish to stay overnight then please consider staying with the Lansdowne. We continue to have a deficit of talks organisers for 2019. This is impacting the community's ability to create an interesting and varied programme, despite the reasonable attendances we get. It's a relatively light bit of volunteering as such things go and if you were thinking you might help, get in touch by email at secretary@mountainviews.ie . The meetings as advertised above will go ahead and we have plans for further members meetups on the hills for 2019 to announce in the coming months. For original summit, click here. 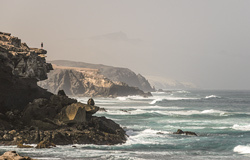 View to the south and west from near La Pared, Fuerteventura. For original track, click here. 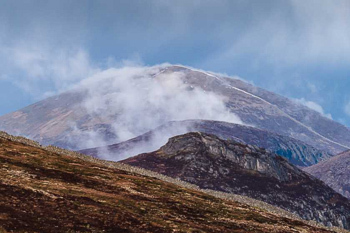 To provide suitable inspiration for those participating in April's Maamturks Challenge, this month's selection sees markwallace exploring the centre of the group to visit the pass that gives the range its name, followed by the lowest major summit, Binn Bhán. His route utilises the Western Way along the foot of the hills, before striking damply and roughly up to the ridge, a textbook exercise in Summiteering tidying up. This walk uses the Western Way and the Maam Turk pass to ascend Binn Bhán. Given that this hill is only 488m high, it’s a long way to go for a modest bag. On the other hand, this is one of only 3 sub-500m peaks in the MV highest rated 100, so it’s got something going for it. Take the Western Way north-west from Ilion. There is a particularly strongly worded no dogs allowed sign here. This section of the Way is currently in good condition, with new bridges, etc. After a little over 3km of Western Way (as its surface starts to deteriorate), take an initially faint track away to the right. This track is shown on OSI 37, but is easily missable on the ground. However, it’s immediately after an enclosure with an old ruin and a small bright green aluminium cabin on the right. The track is saturated in parts, but improves further in and meanders over the ridge. Then, at around L842567, the track crosses the river that flows down from the pass at Maam Turk. Here, rather than crossing the river, I left the track and ascended. If you didn’t want to visit the pass on the ascent, it might be easier to follow the path over the over the river and find an ascent point on the slightly less rugged ground a little further north. Ascending to Maam Turk, I kept the river on my left. Going was made easier by staying further up from the banks, and some faint trails were visible. A few minutes after, the pass finally becomes visible, and a short, steep, grassy climb follows. A fence runs through the pass and up towards Binn Bhán. There’s no need to cross the fence, but if you do there’s a holy well a few feet away, marked on OSI 37 on the east side of the pass. It’s a small hole in the ground with water in it, a stream flowing down east from it, and a ring of stones around it. From the pass it’s another short, steep climb to the summit area where a small cairn on an outcrop marks the top. The formidable rocky bulk of Letterbreckaun dominates the view to the south and the grassy, sprawling Leenane Hill to the east. Also in view are the Twelve Bens and Lough Inagh, Kylemore Lough, Mweelrea, a bit of Killary Harbour. I headed along the summit area north for about 200m to another small cairn and descended from there. Staying as far north as possible eases the angle of descent and the terrain encountered. I met up with the track again at the river crossing and followed it to the Western Way. Possibly a good option on a day when higher summits are in cloud. As the Maam Turk pass and Binn Bhán are out of sight for much of the walk, there is no visible objective, so some navigational knowledge is needed. The most tricky section would be descending from Binn Bhán. Going south or west from the summit look from above like the most direct routes down, but the ground is uncomfortably steep. Therefore it’s better to head north first. Heading back to the pass is also possible, but again is quite steep and also adds time. There are probably easier ways up Binn Bhán from the east (Glenglosh Valley), though they would probably require asking permission, crossing fences, etc. The main advantage of this route is that access via the Western Way is good, and the only need to cross a fence is if you want to visit the well. 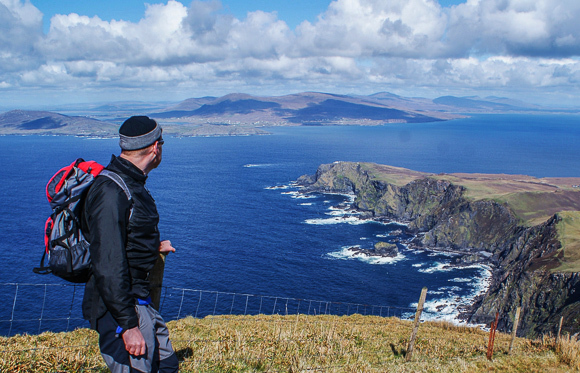 Bagging Croaghmuckros Hill in Donegal SW requires a relatively easy 2k climb up a track, says bertandally, and offers amazing views of Muckross Head and the surrounding area. Breesy by name and by nature, this hill in Donegal/Tyrone is a windy, yet relatively simple bag, and it was even child’s play for a 6-year-old, reports bertandally. MV's excruciatingly English track reviewer felt the need to mark St Patrick's Day with an ascent of one of Ireland's most iconic mountains, the limestone Lost World of Benbulbin. 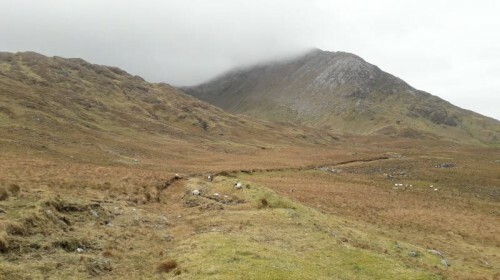 The track covers the approach from the north, with a bit of bog trotting around the plateau via Kings Mountain before the culmination at the edge of Benbulbin's prodigious prow. The route could be lengthened substantially by working round to Benwisken, or possibly even Tievebaun, or you could pay your respects to Yeats in Drumcliffe churchyard instead. The tiny Lackakeely to the west of Mweelrea takes a mere 10 minutes to bag, but provides fantastic 360 degree scenery, says magnumpig. A salutary warning about the potential calamities of technology and clothing, I could mention that David-Guenot's track visits some impressive and lonely territory in Mayo's Sheefry Hills. But it's much more noteworthy for demonstrating the possibility of something valuable tumbling from an insufficiently secured pocket during the course of a walk, in this case a phone...cue frantic searching on the day and a complete retracing of the route (handy things, GPSs) on the morrow. But there are worse walks to do twice on the trot. Visited Slieveacurry on 27th Feb, was eagerly looking forward to finding the tractor as mentioned in jamessheerin`s post dated 14th Oct 2016. Found it! A shadow of its former glory and a sad testament to a culture of dumping in the Hills of Ireland. Having said all that Slieveacurry is a testy little hill with great views north to the Cliffs of Moher and Lahinch. SOUTH: A walk among the clouds. On his ascent of Bautregaum in the Slieve Mish Mountains, Tommy V encounters potential perils especially if climbing in mist. TommyV on Baurtregaum, (Barr Trí gCom): A walk among the clouds. Perhaps the most interesting thing about Carran in Shehy/Knockboy, are the views looking away from this uninspiring summit, reports liz50 in a new short summary. Dalkey Island is a haven of birdlife, beauty and history, reports Maulin. It is easily reached by a short boat ride and has so much of interest you’ll be keen to return. When the subject of 'what's the most unpleasant summit in the MV lists?' is raised Barranisky is an inevitable participant in the conversation. It's always fun to check the current conditions in the greenery surrounding the summit, and simoburn is the latest victim to submit an update as to exactly what size of machete you might need to make the final journey to the hidden trig faintly tolerable. He speaks of 'a little gardening' possibly making the top easy to reach in the future...well, that simply wouldn't be playing the game, would it? simoburn on A bush-wackery experience to the trig point of Barranisky. Three Rock in the Dublin Mountains offers the capital’s dwellers an Arderin almost within spitting distance, with magnificent views over the city and bay, writes TommyV. Often climbed as part of a longer walk around the Kilbride Firing Range, Seefin in Wicklow is sufficiently close to a road to make a nice little family stroll, as Bunsen7 has discovered. His route disregards the slightly manky approach from the west to gain the huge ancient cairn via very easy tracks up through the forest to the south. As this is only a few hours' walking, the obvious extension is to complete the four summits around the range, while another round is possible by heading east to Kippure instead. One of those tops that is somewhat blighted by conifers, Slieve Maan in Wicklow offers little in the way of views, and lots in the way of eye-poking branches, says ewen. The Ridge of Capard in the Slieve Blooms is ewen’s favourite Sunday trek, and the distinctive Stoney Man cairn offers great views of the midlands. Seemingly most of Ireland's hillwalkers migrate to the Canaries ahead of the Spring Equinox, and so it is that GSheehy also brings us an upload from this offshore bit of Spain. His route is basically a full-length traverse of the island of El Hierro, and is illuminated by his usual sprinkling of practical information regarding transport, accommodation, timings and (critically, one would imagine) water sources. The scenery looks nicely varied, even if it seems like the weather isn't! simon3 has uploaded several very interesting tracks from his recent holiday in the Canaries, and your reviewer has made an almost arbitrary selection from them. 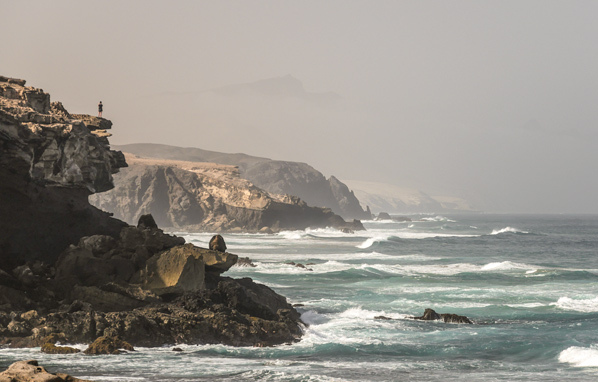 Visiting the island of Fuerteventura, it is a tremendously varied outing both geographically and culturally, treading glorious beaches and headlands, crossing a stark ridge, and also taking in some rather characterful public transport facilities. Sorry if we didn\'t mention what you posted .. there\'s a list of all contributors for recent months later. 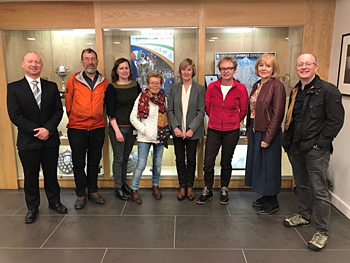 Mountaineering Ireland's new Hillwalking Committee had their first meeting on the 21st of March. 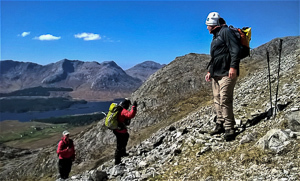 The Terms of Reference for this committee includes providing advice to Mountaineering Ireland (MI) on any matter relating to hillwalking, and providing a voice for hillwalking within MI. It's been some time since MI last had a formal Hillwalking committee, and this newly constituted committee hopes to continue work to further the interests of hillwalkers and hillwalking at a national level. The members of the committee were chosen to represent a wide spectrum of Mountaineering Ireland's hillwalking membership. The initial meeting of the committee primarily discussed the previously agreed upon workplan, and certain projects were identified as initial priorities. There's a number of topics within the workplan that are likely to be of interest to Mountainviews members, and the plan will be adapted and adjusted over time. Report courtest of Roy Madden. Publicity MountainViews is a great resource based on over 1300 people's contributions over 16 years. Great that is if you have heard of it. And that's where we could use some practical publicity help. The Geeks Shall Inherit the Earth Quite apart from programmers, MV's progress can also use help from people who can really follow through on tasks like creating lists, checking stats, researching place names or geology. Whether on the committee or not we value such people's contributions. Talks Group Not strictly speaking part of the main committee but a position involved in finding and selecting interesting speakers and organising the three events we are running each year. From Knockmore, highpoint of Clare Island towards Croagh Patrick. Clare Island had an unreachable and almost mystical presence from my early hill walking days, when I started to make those long journeys to the far off and wild west of Ireland. 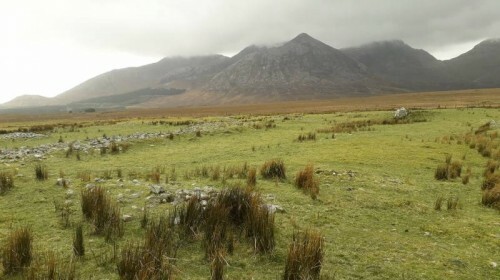 The island was often viewed longingly from the wild mountain areas of Nephin Beg, Corraun or Achill. In my mind this was no ordinary island as it appeared to rise unspeakably sharply from the sea to great heights. It was often shrouded in mist and I easily imagined it as one of those fabled islands from childhood films where time was forgotten. 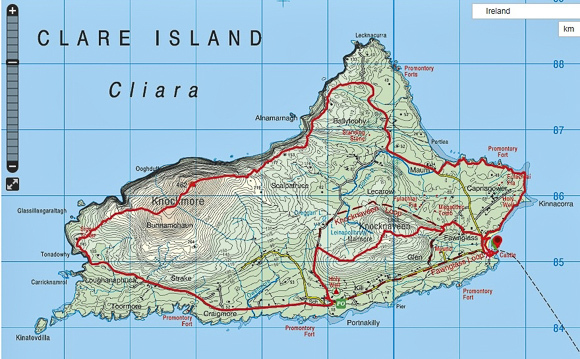 It was in 2012 that I made my first trip to Clare Island. The weather was beautiful and there was a fantastic sense of excitement waiting on the ferry from Roonah Point. It felt like a real adventure because of the expanse of water that had to be crossed and the unknown nature of the land that would be reached. That day trip did not disappoint and standing on the summit of Knockmore Mountain really did feel like I was on top of the world, surrounded by sea and stunning views to the big mountains of Mayo - North and South. Though the island was easily explored in a day there was still a pressure to make it back to the harbour for the last ferry sailing. I had wanted to return over the past 6 years to revisit those wonderful memories and to explore more of the island. In May 2018, with the weather again looked promising, I booked ferry tickets online and started the long journey from Antrim at 5am. Old friends were passed on the way through the Sperrins, the Sligo Mountains and Croagh Patrick - its carpark bustling with early morning activity. I was there in plenty of time for the 10.45am sailing and boarding could not have been easier, showing my e-ticket received by email. The ferry had a good few people on board, with many kitted out in walking gear. The level of excitement was high as the ferry cruised through the calm waters – leaving the towering mountains of Sheffrey, Mweelrea and Ben Creggan in the distance and drawing ever nearer to Clare Island. There is something magical about this and other Irish Islands I have visited. In a way Clare Island is lost in time, less to do with prehistoric animals and more to do with the way and pace of life. On the surface it seems that life is slower and simpler – more in tune with the land, the sea, the weather and the seasons. That feeling has been palpable on both visits. The harbour area packs in most of the ‘bustle’ on the island and has a number of options for visitor accommodation. I was keen to get to the summit of Knocknaveen (223m) which rises behind the harbour and it was in my line of sight as I crossed the lovely beach beside the harbour. The Knocknaveen/Fawnglass Loop Walks took me uphill along a beautiful lane lined with wild flowers and birds singing. Within minutes houses were left behind. I had to wait for a time as horses were herded along the lane to pastures beneath Knocknaveen – I was then able to leave people behind. The Looped Walks were left behind as a beeline was made for the summit of Knocknaveen – all to the backdrop of the harbour ever further below and the awesome sight of Doolough Pass flanked by its monstrous guardians. It was even better at the summit with superb views of Knockmore’s shapely profile. The traverse of this hill was a joy with easy walking and all those views before dropping down to the road. The church at 689 844 was well worth exploring as I passed and like other significant buildings on the island had excellent information boards. There followed a 4km walk along the super quiet road along the south of the island – this was familiar territory as it was followed on my previous trip - all the way from the harbour. I was able to fill my bottle (with filter) from one of the small streams on the way – a great way to work if possible to save on all that weight of water. The real joy for me was reaching the old Signal Tower (651 853) at the far west of the island. Cliffs dropped 100m into the sea, Knockmore towered ahead and the jagged seascape of Achill projected in the distance. This would have been an ideal spot to camp if it had of been later in the day and I took time to chill and have something to eat. It was a hard slog up to the summit of Knockmore carrying a full pack of camping gear. My laboured breaths were eased ever so slightly by the sheer cliff drops, soaring seabirds and increasing views over a vast expanse of ocean. 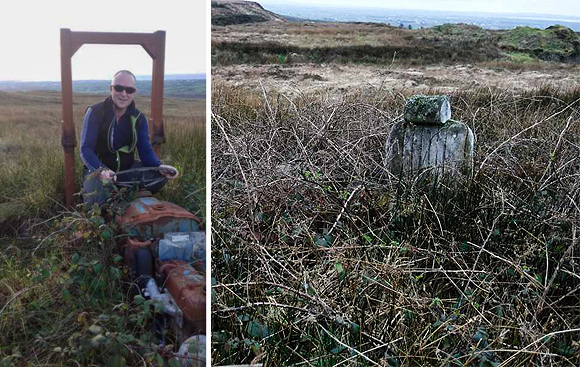 There was a fantastically impressive beehive cairn on the way to the summit trig point – this presented what must be one of the most impressive viewpoints in all of Ireland. It got even better on the steep NE descent, following closely the line of cliffs that stretched impressively to the lighthouse at Lacknacurra (694 882). This trip had a height gain/loss of nearly 1,000m and most of it was in this stretch as I rose and fell following the coastline as closely as possible. Light was fading and I decided not to go for the lighthouse but head west to reach the road. I had a camp spot in mind and after a couple of km on the road reached the spot where the Dorree River entered the sea. Camp was set up nearby above the storm beach at Portlea (685 859). I had plenty of water for cooking and making tea as I tried in vain to curse and swat swarms of midges out of existence – the price to pay when the wind fell away with the evening. Instant noodles and tuna was my meal of choice for ease of cooking and energy value. I was in my bivvy as darkness took hold – well satisfied with a fantastic day walking. The bivvy is great as are open to the world of senses and I had the sights and sounds of a large fish farm being worked just offshore by a brightly lit up trawler. I awoke to a beautiful sunrise and was soon busy getting water, making a brew and having breakfast. Cloud was clinging to the bright flanks of Knockmore Mountain and a pillar of light from the sun shot straight across the sea to my campsite. The return ferry was at 10.15am so I had plenty of time to explore the last section of coastline – following cliffs and dropping down to a rocky shoreline with plenty of scrambling. I soon picked up the track/road and had time to sit on the harbour wall watching life go past (slowly) and the shoal of fish beneath my feet in the clear waters. Looking to NephinBegs with Corraun Peninsula in front, Achill to the left. As I sat on the ferry watching the Island retreat I had a great feeling of contentment reflecting on the wonderful memories that had been created. I also had the opportunity to talk to some fellow walkers who had been staying for a few days. They reflected too - on the Island and its hard beauty – with young people leaving for work and education never to return and an aging population working hard to live from the land. 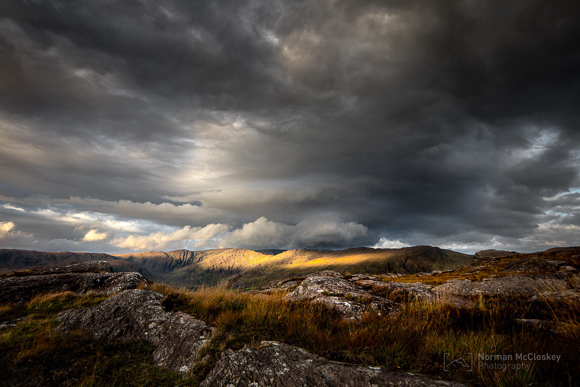 Norman McCloskey is a landscape photographer based in Kenmare. 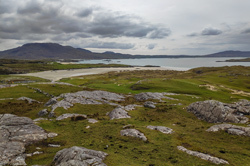 Beara, his new book of photographs opens the door to the Beara Pennisula and welcomes us in. Each photograph drew us in and commanded our attention. We were greeted with spectacular views of the sea, forest, seasons and mountains. We could feel and see ourselves walking the roads of Reentrusk and Urhan, dipping our toes in the Allihies waves and sitting among bog cotton in Caherkeen watching the sea. The photos of the Beara Mountains, Hungry Hill and Baurearagh Mountain light, to name just a few from this new book are spectacular. Norman McCloskey’s use of perfect framing throughout the book is so impressive, that one can say that he draws using a camera. We enjoyed his use of long exposure with water bodies; it makes photos look magical, almost dreamlike. The use of natural light and various shades of brown and blue, bring a very peculiar feeling of melancholy mixed with serenity, as if we are missing these places, that we have never visited before - truly amazing. Overall a beautifully finished book loaded with crisp, fresh photos that will take you away to Beara. The place names hold their own sense of curiosity and intrigue with names like Zetland, Tuosist and Uragh. We were compelled to find out more about them. Zetland Pier, for example, is a well known local beauty spot for swimming, fishing and snorkelling. This is just one of the many places in the Beara Peninsula we would like to visit. Beara is a beautiful and captivating book. Norman McCloskey exudes on each page what he has personally found in the area. His generosity to share this with us is big hearted. It is filled with calmness, occasional turmoil and a real sense of healing that can be found in nature. This is a book to be picked up again and again. A treasured gift to give to anyone, including yourself. If you never get the chance to make a journey to the Beara Peninsula. Norman McCloskey’s Beara will take you there. For Hillwalkers, Beara is a visual guide to the mountains one can hike in the area. There is a photo of a mountain on almost every page. 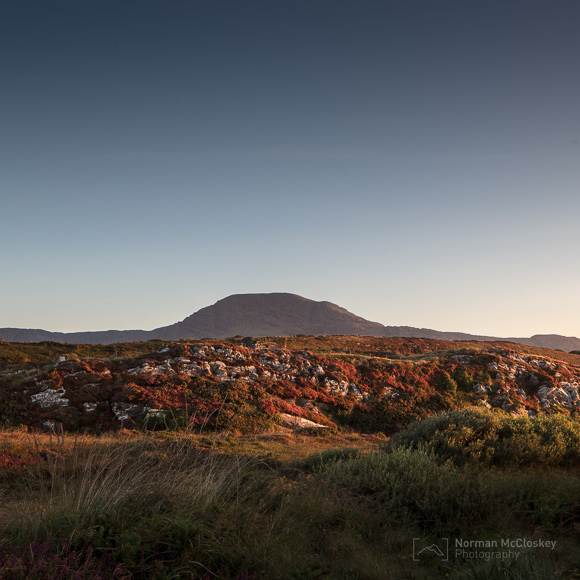 Beara has 120 pages and contains 90 beautiful images. It can be bought from the following website; www.normanmccloskey.com for €35.00 or €85.00 for a limited edition. It can also be bought from Norman’s prominent shop on Kenmare’s main street (where you can often meet the man himself). Beara is distributed by Argosy Books in Ireland. It is available from any bookstore who can order it. It is also on the shelves in Hodges Figgis, Dubray Books Grafton Street, and the Irish Design Shop in Dublin. 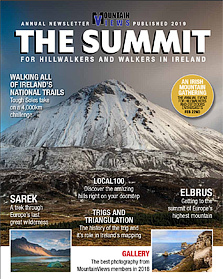 60 pages in 13 Articles about walking on hills, mountains and islands here and abroad. If you've managed to stay tuned to this channel, you will remember how last month we touched on how the seriously cold end of the weather spectrum, can hit the early Challenge Walks hard . . ! Well, the time is now! All Challenge Walks are early - as in, the budding Walker has to be up and out, with breakfast taken and dancing shoes on, sometimes as early as 4 in the am (or even earlier) for a five o'clock kick off!! Nope, the early in this case - are the early dates for the first Events on the Challenge Walks Calendar 2019. This Saturday (the 6th April) sees the first outing on the Calendar and the 44th anniversary of the Maumturks Challenge as hosted each year by the ever busy boys and girls from NUIG Mountaineering Club. Don't think for one minute that the phrase "boys and girls" is in any way condescending . . . Absolutely not!! The organising committee has been primarily made up of students at NUI Galway, so has as such, it has seen a continuous shuffle of many a helper. Well over 40 years on, this is incredible testament to all who have made the Walk so iconic . . . and continue to do so! Everyone from the Galway Radio Experimenter Club who give support on the ground (and over the airwaves), to Mountain Rescue who are always at hand, to the Stewards on the day itself . . . all have played a valuable part in making this date one of the most sought after on the Calendar. Sought after being an understatement!! 8 seconds saw all tickets allocated, with only a handful of "dropped purchases" free to throw back into the pot! So, all in all, even with the first date on the Challenge Walks Calendar, NUIG Hillwalking really have an Event to be proud of . . . but of course, they know this already! The following week (13th April) another great Event takes place as Peaks Mountaineering Club proudly host the fantastic Knockmealdown Crossing. Whilst not going as long as the Turks - it is now firmly established as one of the most popular on the Calendar. Altitudes are generally higher on this Walk and as it's pretty much a ridge walk too - there is no hiding place (weather wise) from the wilds of the Knockmealdowns in all their glory. Atop Knockmealdown Mountain, which has an altitude only a handful of metres short of the 800m mark, there is a biting wind that can lacerate every bit as much as a thousand paper-cuts! No exaggeration! On this Day, Peaks Hillwalking have pushed the boat out on the hospitality side of this Walk, with their famous welcome (and stew!) bringing back many a returning Walker each year. No doubt the regular reader dozes off when I ramble 'bout the weather aspect of these early Walks . . . but these two dates are absolutely at the mercy of the Hillwalker's nemesis - or best friend . . . Day Dependent! An advance gander at the forthcoming weather certainly looks promising, but at time of going to press, there's to be overnight frost atop the Turks early April, but either way both Walks never fail to treat the Challenge Walker to a marvellous day out. The avid Challenge Walker too, is slow to be in any way phased by inclement weather - sure aren't we getting out and about, and down and dirty, in the company of like-minded individuals who are only too delighted to share tales of previous year's escapades . . . and even give away their last "hang sangwich"!! All the more reason to support a local Challenge Walk near you! But never fret! If a Challenge Walk sounds a little daunting why not cut your teeth, or your new boots, at one of the MountainViews Members Meet Up Walks . . . . The Mourne Mountains beckon this Saturday too (6th April) with full details earlier in this Newsletter! Keep Safe and Enjoy your Day!
. . . And as we said at the start - "Stay tuned to this Channel". A place for those interested in Summiteering, Bagging, Highpointing, visiting islands and coastal places. and these shared tracks An Starraicín, Central Dingle Ireland, Ballinastraw, Dublin/Wicklow Ireland, Benglenisky, Twelve Bens Ireland, Binn Bhán, Maamturks Ireland, Binn Charrach, Twelve Bens Ireland, Brandon Group Ireland, Brandon Group Ireland, Brandon Group Ireland, Cairngaver, Belfast Hills Ireland, Carnanelly, Sperrin Mountains Ireland, Carrigroe Hill, North Wexford Ireland, Carrigshouk, Dublin/Wicklow Ireland, Corcóg, Maamturks Ireland, Corick Mountain, Sperrin Mountains Ireland, Crossone, Mourne Mountains Ireland, Dublin/Wicklow Ireland, East Coast Ireland, Faill an tSáis, Brandon Group Ireland, France, Normandy , France, Nouvelle-Aquitaine , France, Nouvelle-Aquitaine , France, Occitanie , Kanturk, Dublin/Wicklow Ireland, Kings Mountain, Dartry Mountains Ireland, Knockaunapeebra, Comeragh Mountains Ireland, Oulart Hill, North Wexford Ireland, Silver Hill, Bluestack Mountains Ireland, Slieve Croob, Mourne Mountains Ireland, Slievenaslat, Mourne Mountains Ireland, Spain, Canary Islands , Spain, Canary Islands , Spain, Canary Islands , Spain, Canary Islands , Spain, Canary Islands , Spain, Canary Islands , Spain, Canary Islands , Tara Hill, North Wexford Ireland, Tawny Rower, Sheeffry Hills Ireland, Tomaneena, Dublin/Wicklow Ireland, Vinegar Hill, North Wexford Ireland tracks were created. Thanks to all 1359 who have ever contributed place or routes info and forums. Summary. MountainViews now has 9238 comments about 1766 different hills, mountains, island and coastal features out of the total in our current full list (2159). We want to get a good gps track showing each of the major ways to visit each of these places and summits in Ireland. If you see an option to add a "Short Summary" then do please consider creating one since another objective is to have a short summary for every summit and island and coastal feature in Ireland. There's quite a few (393) opportunities for you to be the first to comment on a place, not so many on summits, however lots of opportunities for islands and coastal features as we bring them out. We also have around 2000 shared GPS tracks, mostly in Ireland. Apart from a few popular areas, there is a need for more routes in many different areas. Plain shared tracks without descriptions are welcome however if you have time then do please add route descriptions with photos. Take care if parking and do not obstruct roads, lanes and field entrances to access by farm machinery, which can be large. Exercise your dog in parks or forests but avoid countryside or open hillside where they may worry sheep. If you have visited some of the less well known places, we would appreciate a place rating and also "Improve Grid Ref" for summits and other places. If you find errors in the basic information about places such as in their names, their heights, county name etc please use the "Propose Places Database Change" option. If we can, let's make MV have more than one route up a summit or to a place so as to reduce the tendency for paths to appear. 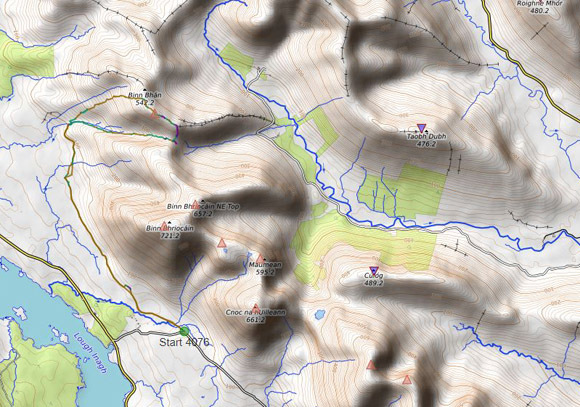 Your grid refs in comments for different starting points show up on MountainViews maps as well as shared GPS tracks.